Robin Robertson's fourth collection is, if anything, an even more intense, moving, bleakly lyrical, and at times shocking book than Swithering, winner of the Forward Prize. These poems are written with the authority of classical myth, yet sound utterly contemporary: the poet's gaze -- whether on the natural world or the details of his own life -- is unflinching and clear, its utter seriousness leavened by a wry, dry and disarming humour. 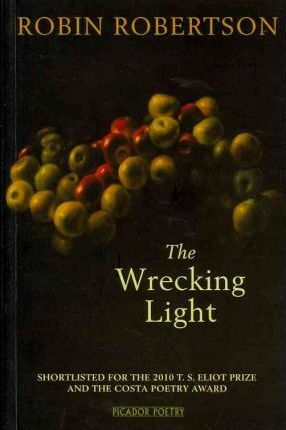 Alongside fine translations from Neruda and Montale and dynamic (and at times horrific) retellings of stories from Ovid, the poems in The Wrecking Light pitch the power and wonder of nature against the frailty and failure of the human. Ghosts sift through these poems -- certainties become volatile, the simplest situations thicken with strangeness and threat -- all of them haunted by the pressure and presence of the primitive world against our own, and the kind of dream-like intensity of description that has become Robertson's trademark. This is a book of considerable grandeur and sweep which confirms Robertson as one of the most arresting and powerful poets at work today. Robin Robertson is from the north-east coast of Scotland. A Painted Field won a number of awards, including the 1997 Forward Prize for Best First Collection and the Saltire Scottish First Book of the Year Award. His second collection, Slow Air, was published in 2002 and he has received the E.M. Forster Award from the American Academy of Arts and Letters. Swithering won the Forward Prize for Best Collection.